During the “Creating Connection to Print Manager Plus Reports Center Standard Database...” Portion of the install the following error message appears. In some cases, there is a permissions issue with one of the configuration installed automatically by the Microsoft SQL Express installation of Reporting Services. The following steps will resolve this issue. 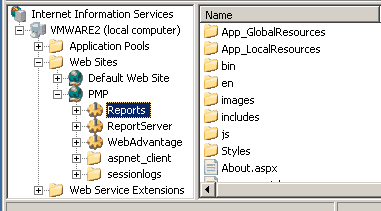 In IIS, you will want to right click on the Virtual Directory named ReportServer within the PMP site and choose Explore. This will open up the directory where the rsreportserver.config file exists. 3. 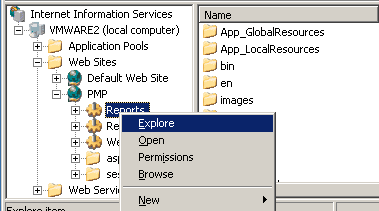 Add Network Service to have Read Permissions:The above step will open the directory, which contains the rsreportserver.config file. Right click on this file and choose Properties. Within Security you will need to add ‘NETWORK SERVICE’ to have read permissions. After the above has been completed, rerun the installation. If the above did not resolve the issue, please follow these steps. Save a screenshot of contents when browsing that URL. It will usually contain an error message.